India's current Bailey bridges are restrictive for traffic; modern two-lane high capacity emergency bridges will serve a better purpose. DELHI, India - April 12, 2014 - PRLog -- Writing in the new issue of Indian Military Review, a former director general of the Border Roads organisation (BRO), says reaching the affceted areas in the aftermath of a disaster is the highest priority. Disruption of roads and connectivity are the biggest impediments in moving men and material. It would help if modern emergency bridges are pre-positioned in critical areas. Lt Gen S Ravi Shankar says equipment bridges used by the army are only half solutions.. Once launched they remain for years, restricting traffic and limiting loads that can be carried on important roads. According to him the answer is clear - mechanically launched bridges made with special alloys, heli-portable but replaced with more rugged ones. Shankar talks of Bailey Bridges as versatile pre-fabricated options but the same are of World War II vintage. They have been used extensively but are not specifically held for disasters. The Army has to pull them out from war reserves, says Ravi Shankar. Modern bridges like Acrow and Mabey offer good options for Indian scenarios. They may be expensive but are versatile and fit formilitary as well as civil use. They are adaptable for roads, rail and via-ducts, according to Ravi Shankar. 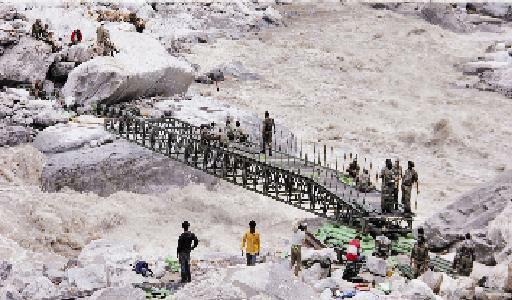 For better cost benefit, the country and the National Disaster Management Authority should graduate to better emergency bridges.